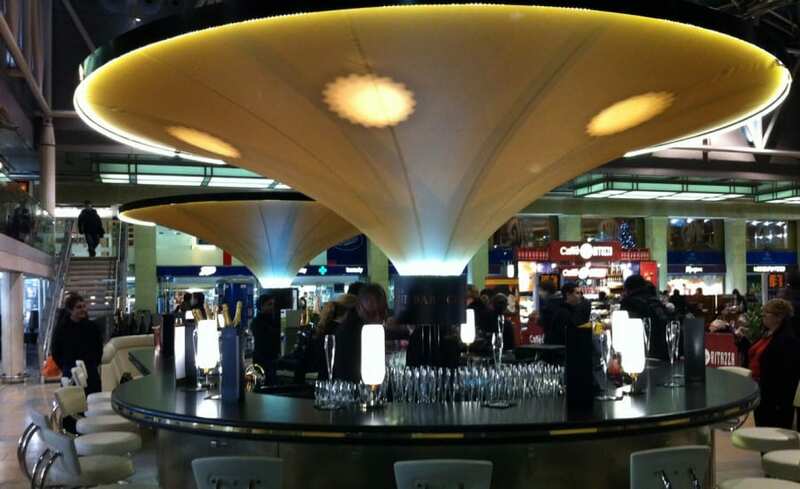 Creating an upmarket champagne bar in the middle of the hustle and bustle of one of the busiest stations in the world is a mean feat for any designer, however, Interbar Design and Build approached it in a pragmatic way; by introducing tensile fabric conic canopies to create a more enclosed and exclusive feel to the space. 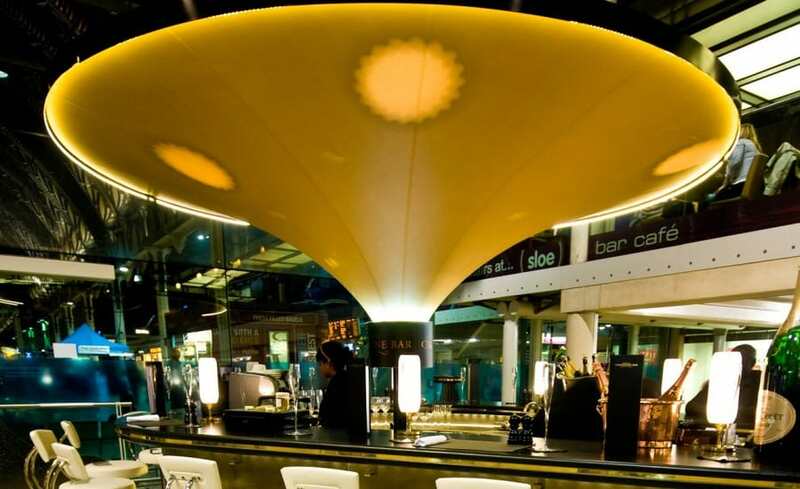 After commercial discussions with Interbar Design and Build, Architen Landrell was contracted to design, engineer, manufacture and install two permanent conic canopies over a bar and restaurant in Paddington Station, London. The champagne glass shaped canopies hold a dual function. 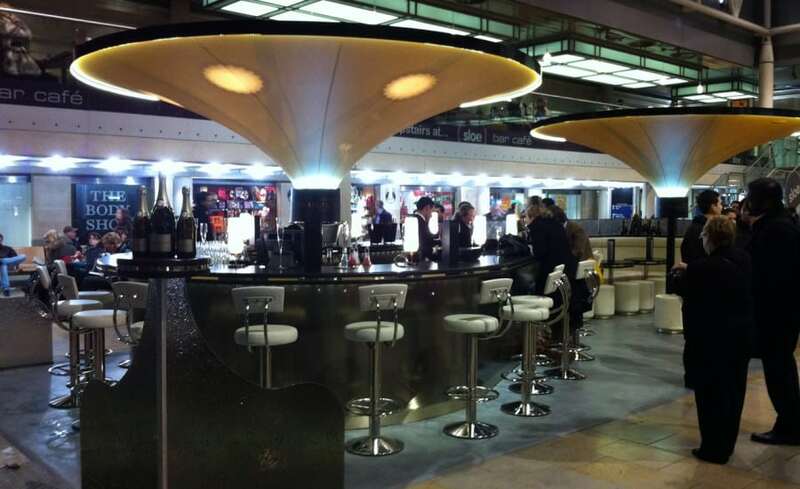 Firstly to create a sense of intimacy around the bar area but they also serve to provide a cover to protect patrons from pigeon droppings and to offer privacy from balconies above. 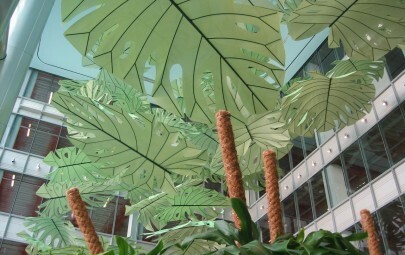 A gold metallic PVC coated polyester mesh fabric was used to form a lightweight canopy with complex geometry. The slightly random holes in the Soltis 92 fabric replicated bubbles rising in the champagne and worked well with the integrated lighting which shines from both below and above. 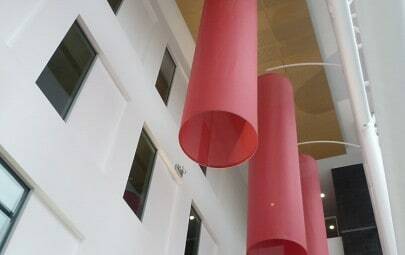 The open location of the canopies was important within the design and manufacture of the supporting steel structure. As In order to reduce the risk of people trying to climb the structure and to minimise damage should climbing occur, the steelwork was designed to be concealed within behind the fabric membrane and was reinforced to withstand additional weight if required. 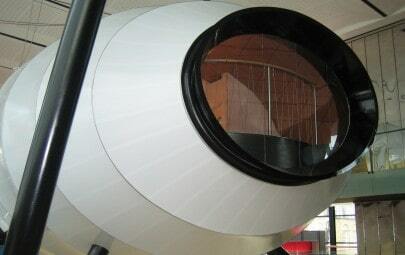 Location was also an additional complexity for the installation crew as the site was fully open to the public. Careful sequencing of works, coordination with other trades, night working and very fast track compressed programme all had to be overcome in order to bring this project to a successful close on time and within budget.